In one of the tightest governor’s race in the country, two very different candidates for the highest state-level elected office in Oregon. One, Democrat John Kitzhaber, is a former Oregon governor who wants to build up the state’s green economy, protect public health and wildlife habitat, and continue Oregon’s leadership role in the fight against global warming. Meanwhile Republican Chris Dudley—a basketball player with no political experience—opposes regulating carbon, is open to offshore oil drilling along Oregon’s coasts, and isn’t sure whether global warming is caused by human activity. The choice for Oregon couldn’t be starker. John Kitzhaber, who’s been endorsed by the Sierra Club and the Oregon League of Conservation Voters, is a very green candidate. It just happens that in the primary, he was up against someone with even better energy and climate plans. Kitzhaber’s green credentials were outshone by Bradbury’s in the primary—but running against almost anyone else (or in anyplace other than Oregon), Kitzhaber would have been the clear environmental choice. This is certainly the case now that it’s come down to a race between Kitzhaber and Dudley. Chris Dudley has gotten as far as he has in the governor’s race mainly by outspending Kitzhaber. When an early poll showed Dudley doing better than expected in the polls, big business poured money into his campaign. Dudley apparently feels secure enough with his monetary advantage that he agreed to only one in-person gubernatorial debate, showing he’s more interested in being seen as a smiling five-second presence on TV than in actually digging into issues and concerns Oregonians care about. Dudley has repeatedly failed to respond to media inquiries about his environmental views, but what has emerged is extremely worrying. So far we know Dudley wants to weaken clean water rules, increase logging in Oregon’s forests, and backtrack on the state’s ambitious climate and clean energy goals. When asked during the one-and-only debate with Kitzhaber if he believes humans are over-heating the planet, Dudley said he wasn’t sure. A win for Chris Dudley would be a disaster for environmental progress in Oregon. 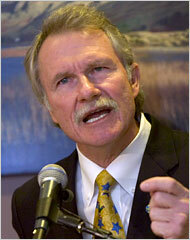 A win for John Kitzhaber means Oregon will be able to continue its leadership role on climate and clean energy issues. The latest polls show Dudley and Kitzhaber virtually tied in the governor’s race, so youth voters could make all the difference in deciding the outcome. Now is a historic moment for youth voters in Oregon: this year we’ll be the ones deciding one of the most important environmental elections in the country. Be sure to turn your ballot in when it comes in the mail.